"There will be a substantial reward for the one who finds the Millennium Falcon." The 2018 Star Wars™: Destiny National Championships are a celebration of the game's greatest players, strategies, and fast-paced, dice-and-card action. They're also a great chance to win some of the game's coolest prizes! 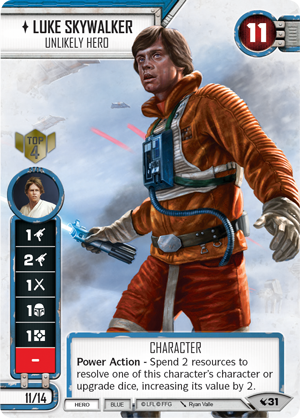 The top 64 participants at each 2018 Star Wars: Destiny National Championship tournament earn a double-sided card that features alternate art versions of Luke Skywalker and Boba Fett from the Luke Skywalker Starter Set and Boba Fett Starter Set. Shown wielding his lightsaber atop the snowfields of Hoth, Luke Skywalker is not yet a Jedi, but he has already proven himself a hero of the highest order. He has destroyed the Death Star and coordinated the most effective response to the Empire's AT-AT walkers. This Luke is a hero of seemingly limitless potential, and this heroic artwork by Ryan Valle will reshape the way you think of his unique power action. Boba Fett, meanwhile, is depicted by Matthew Zeilinger as the consummate professional, coolly considering his next target, rifle slung casually over his shoulder. Matthew Zeilinger's art draws attention not only to Fett's rifle, however, but his back-mounted rocket and the weapons on his wrists, as well. 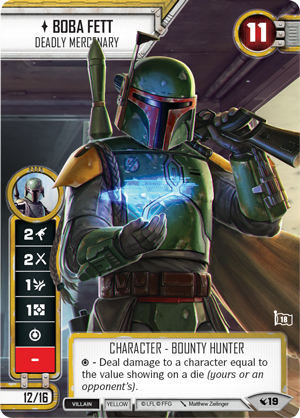 This is a Boba Fett who's ready for anything—as befits the versatility and lethality of his dice. Make your way among the Top 32 participants at a 2018 Star Wars: Destiny National Championship and you'll earn yourself a double-sided plastic plot card, featuring Preemptive Strike on one side and Fortify on the other. 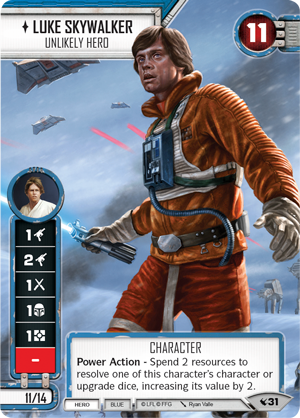 After making their debut to the game with the Legacies Booster Packs, plot cards have settled naturally into the Star Wars: Destiny meta at all levels—providing a natural complement to combinations of characters that weigh in at just under thirty points. This double-sided card features alternate art that lends each plot a renewed sense of strategic import. On the Fortify side, you'll find General Rieekan checking on your shields from the command center of Echo Base. 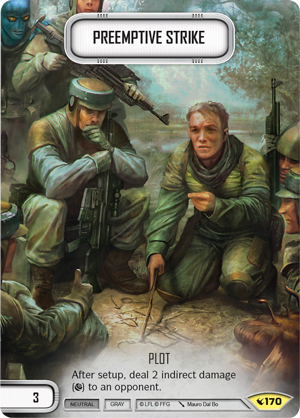 On the Preemptive Strike side, you'll find a squad of Rebel scouts plotting their next attack—and with your plot, you'll be able to start dealing damage before your opponent even takes an action. The Top 16 participants at each 2018 Star Wars: Destiny National Championship earn a set of nine custom shield tokens. 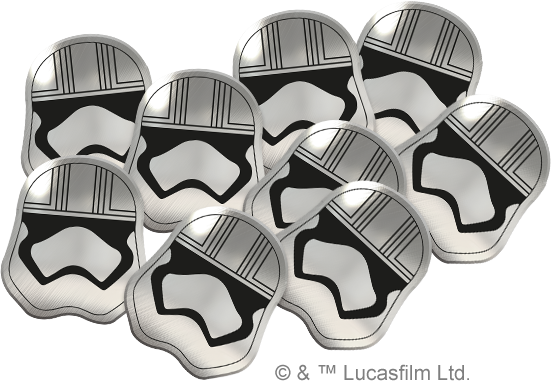 Based upon the design of Captain Phasma's helmet, these shield tokens offer protection worthy of the First Order's finest! As a game of "What if?" 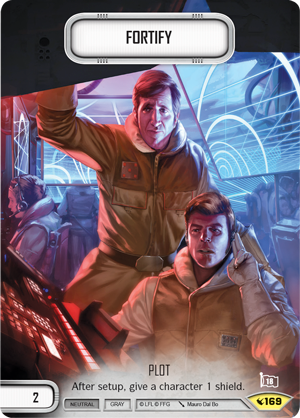 battles that spans the entire Star Wars saga, Star Wars: Destiny can be truly unpredictable. You might face a trio of troopers loaded with blasters. You might face a pair of dark side Force users armed with lightsabers and Force lightning. Or you might face a "mill" strategy that seeks to run you out of cards before you can destroy your opponent's characters. 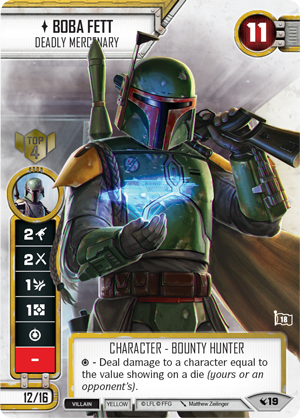 To make the Top 8 at a 2018 Star Wars: Destiny National Championship, you'll need as versatile an arsenal as that belonging to Boba Fett. And you'll be able to commemorate your success with a stunning playmat of the fearsome bounty hunter in action. The differences between the Top 4 at a 2018 Star Wars: Destiny National Championship and the rest of the field don't typically reside so much with selections of cards and dice as how the players are able to make use of them. To make the Top 4, you need to think carefully at each action step. You need to remember your characters' abilities and play intentionally around the events in your hand. You might have the same characters and upgrades as your opponent, so you need to put them to better use. 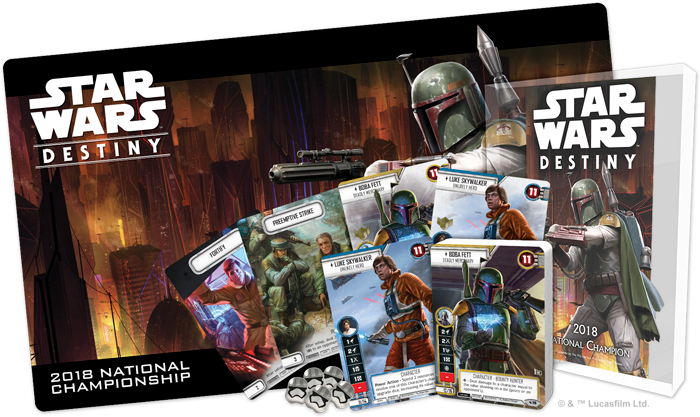 In keeping with this concept, the Top 4 at each 2018 Star Wars: Destiny National Championship receive a double-sided plastic version of the same Luke Skywalker and Boba Fett card as is rewarded to all participants. But it's better—made from plastic, durable, spot-glossed, and foil stamped to commemorate your Top 4 finish. Every good bounty hunter needs to show ambition, and the greatest among them are always aiming for bigger prey… As a finalist at a 2018 Star Wars: Destiny National Championship, you'll earn the chance to pursue the greatest prey of all. The Top 2 players at each 2018 Star Wars: Destiny National Championship earn a free seat to the next Star Wars: Destiny World Championships, allowing them to continue their pursuit of the World Champion title! 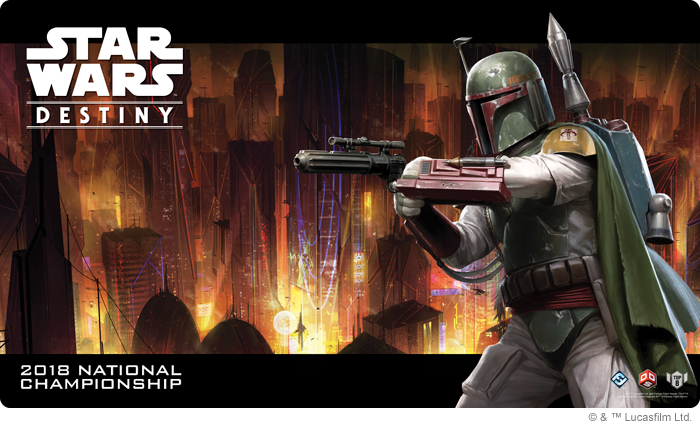 As National Champion—like Boba Fett—you'll be preceded by your reputation, and your 2018 Star Wars: Destiny National Championship trophy will cement your status among the galaxy's most resourceful hunters. Additionally, while other World Championship participants will have to blast their way through the chaos of rival hunters—you'll be able to focus on larger prey, clutching a first round Prize Bye that allows you to chase the tournament's biggest bounties! Make your mark upon the galaxy and collect your bounty at the 2018 Star Wars: Destiny National Championships. Look for more information on our 2018 Star Wars: Destiny National Championship website, and be sure to check back as this information will be updated over time!